Let’s organize an all-expense trip to Iran for you for a chin reshaping surgery, something that gives your self-esteem a great boost. If you can’t afford to get your recessed or prominent chin reshaped in your home country, why don’t you travel to another country like Iran? Indeed, It’s not only about the price. It’s also about so many other things like getting more natural results, less visible scars, shorter recovery time, and high-quality medical care. If your recessed chin makes your nose look bigger or you're obsessed with your chin deformity, genioplasty or chin surgery is the right option for you. Thanks to the development of medical tourism, a cosmetic procedure like genioplasty is not a risky, expensive and out of reach procedure anymore. With effective and affordable chin reshaping options, Iran is a great destination for health tourists who want to have chin reshaping surgery. That's why we dedicate this post to shed light on chin surgery in Iran. First of all, let us define genioplasty! Genioplasty, also called chin surgery or mentoplasty refers to the surgical procedure of chin reshaping with the purpose of facial beauty enhancement. When the surgery is done on a small or recessed chin, it's called chin augmentation. When the surgery is aimed to reduce a prominent chin, the procedure is called chin reduction. Depending on the type of surgery, either plastic or maxillofacial surgeons may carry out the surgery. The procedure will also differ based on what type of improvement your chin requires. These procedures will be discussed in section 'how is chin surgery performed?'. Why consider getting your genioplasty in Iran? As a cosmetic surgery hotspot, Iran has topped among other countries for the beauty craze among its nationals. Citizens of other countries are also traveling to Iran to get their ideal shape under the knives of Iranian surgeons. The reason lies behind three major facts. First of all, Iran enjoys a wide range of plastic surgeons and medical specialists who are well-versed in their areas of specialty. Customizing and scaling chin surgeries for each patient, Iranian surgeons carry out the most complicated surgeries at its best. Second, the high number of plastic surgeries performed in this country indicates how reliable Iranian surgeons have been in performing such surgeries. In a study carried out by Rhinology Research Society of Iran and Johns Hopkins University, the results show that the number of per capita plastic surgeries performed in Iran is 2 to 7 times more than America. This research also indicates that the chin surgery rate in Iran is two times greater than in America. Most cosmetic procedures like chin reshaping surgery are not covered by insurance in many countries. So, the budget is considered an obstacle for many people who wish to undergo this surgery in their home country. With effective yet affordable chin surgery, Iran has emerged as a perfect destination to go for such surgery. The cost of your chin reconstruction surgery depends on the type of surgery you need to undergo. Chin implant in Iran costs from around $1,500 to $3,000. Osseous genioplasty or chin enhancement with bone surgery costs much higher, from $4,000 to $5,000 as it is a more complex procedure. Moreover, if you are opting for chin augmentation with dermal filler or fat transfer in Iran, the price would fall somewhere between $500-$700. The cost of your genioplasty in Iran is around 2 times lower than the cost you would have to pay in other countries around the world. For instance, getting a chin implant in the USA or UK would cost from $3,000 to $6,000. This price goes up to $7,000 and more if the chin enhancement surgery is done through osseous genioplasty in these countries. How is chin surgery performed in Iran? Chin surgery aims at creating a balance between the chin and other facial features. It is done either by augmenting or reducing the size of the chin. So, the procedure will vary depending on the type of surgery. Generally, the bone within the chin will be broken in a controlled way, so that it can slide forward or backward to be repositioned and fixed into the desired place. The surgery takes place under general anesthesia. It has permanent results, and unlike what might be expected, it is not painful. This surgery is one of the most frequently done forms of genioplasty since it easily adapts or can be adapted to many different functions. In this method, the surgeon makes an incision through the gum. The chin bone is then cut, which enables the surgeon to break the chin bone in a controllable way. Then he moves the bone to its new position and fixes it into place with tiny screws. The incision will then be sewn up with dissolvable stitches. To increase or reduce the length of the face, the bone can be moved up or down as well. 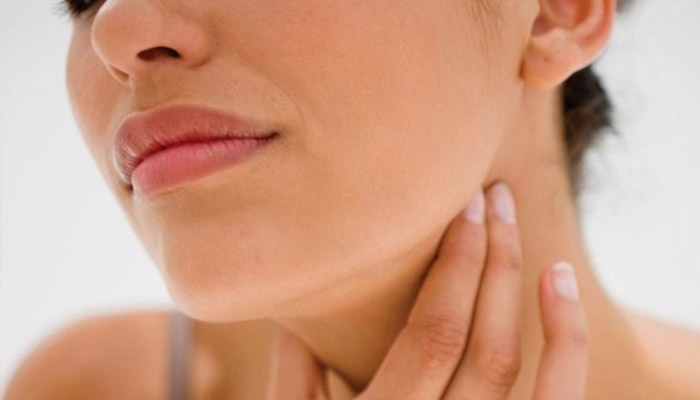 People with weak chins who need chin augmentation may benefit from this type of surgery. 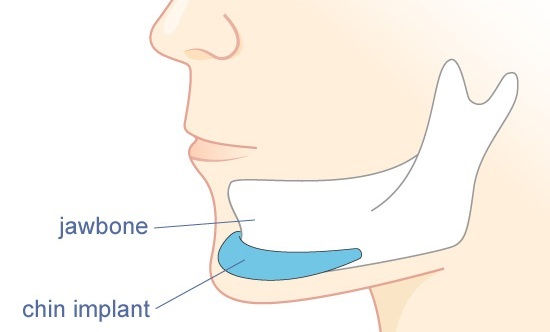 In this procedure, an implant, typically made from silicone, is inserted and adhered to the chin bone. This procedure takes about 1 hour or less, and it has a shorter period of recovery compared to the chin bone surgery. For those who are looking for a non-surgical solution to add harmony to their face, dermal fillers may be a good option. 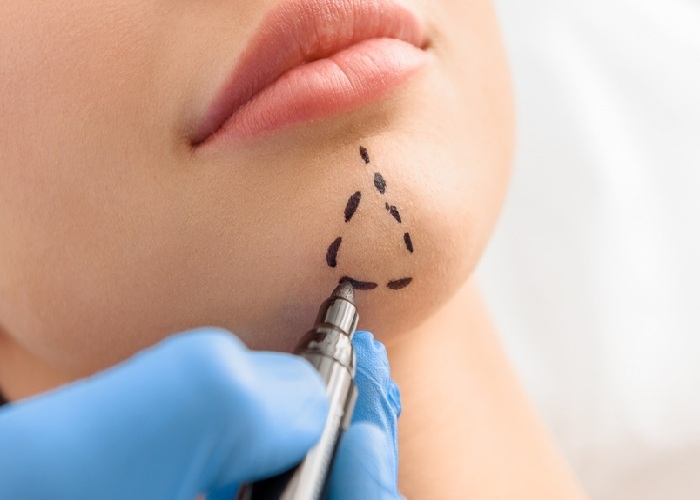 With injecting dermal fillers beneath the chin's skin, the jawline and chin will be augmented. This method does not bring long-lasting results. The augmentation results last for 6-12 months. To learn more about this procedure, go to 'dermal fillers in Iran'. Fat transfer is introduced as an alternative to the chin implant. In this procedure, the surgeon uses the patient's own fat, usually taken from another part of the body with excess fat like abdomen, to bring the chin into better proportion with the rest of the face. The drawback of this method is that it's a temporary solution and usually it lasts for 2-3 years. To learn more about this procedure, go to 'fat transfer and injection in Iran'. Going for one of the aforementioned methods depends on the patient's condition and preference. When the chin is extremely protruded or recessed, the surgeon may recommend a chin implant or sliding genioplasty. Fat transfer and dermal fillers are recommended for those who are looking for a temporary solution or less modification on their chins. Double chin refers to the excess sagging fat under the chin, which occurs due to obesity, genetics, or other factors. A double chin can be treated through double chin fat removal. This procedure can be done using other cosmetic procedures like liposuction. To learn more about this procedure, go to 'double chin surgery in Iran'. What to expect after genioplasty? When you're getting sliding genioplasty or a chin implant, you may experience swelling, bruising, and discomfort for a few days after the surgery. Swelling may last for two weeks. You may also experience a feeling of numbness on the lower lip and inside the mouth. The surgery stitches will be absorbed soon. So, you won't need to go to the hospital to have them removed. Most patients go back to their work one week after the surgery. However, the patients need to be cautious about doing strenuous activities within the first month following the surgery. In the case of fillers and fat grafting, no serious recovery period is involved. These procedures can barely be considered as surgery. For both procedures, there may be some degree of swelling, although the patient is able to return to work the day after the procedure. Is genioplasty right for me? People who are in good health but suffer from a disproportional profile with either a small or protruded chin may undergo a chin enhancement surgery. The candidate’s jaw condition and function are also considered as important factors. The right candidate should have a healthy normal-functioning jaw to be able to undergo an effective chin reconstruction procedure. Chin surgery has been found to be a safe procedure for correcting chin deformities. Above 90% of patients are satisfied with their surgery results, based on a study published on ScienceDirect. With that being said, when there’s a surgery, there might be some risks or side effects. Swelling and bruising are the most common side effects posed by this surgery. Other side effects include adverse reaction to anesthesia, infection, numbness in the lower lip, and migration of chin implant. These side effects do not happen very often and all of them can be controlled when observed. Therefore, with no major risk reported for this surgery, this aesthetic procedure can be done with no concern. Does chin surgery leave a scar? Chin reshaping surgery, whether it is an augmentation or reduction genioplasty, does not leave a noticeable scar after the surgery. This is because the incision is made inside the mouth. This way, there will be no external scar left.